This website (carbonstories.org) is devoted to reflections on politics, culture and our changing climate, as experienced primarily from the seat of a bicycle. Cycling provides a great vantage point for observation, and shares an affinity with many other physical activities that rely soley on human power and do not require the use of motors. Because most forms of non-carbonized locomotion are quiet and reasonably slow-paced they are all excellent platforms from which to observe natural phenomenon. Unfortunately, in our hyper developed world, most of us spend the better parts of our days in conditioned spaces of some sort - traveling in a car, taking public transit, or working and living in our offices and homes. Some of us are lucky enough to be outside intentionally on occasion. Others of us are outside every day because of our occupations - construction workers, landscape staff, farmers, ranchers, fishermen, utility repair workers, and so on. But how many of us pay deep attention to what is really happening around us in our natural environment? Most of us understand intellectually that climate change is well underway. But what are we noticing that tells us this is so? Can we articulate the changes occurring around us? Probably most of us cannot - it's a big step to go from what we are experiencing to having enough information to create meaning. We notice it's hot, but do we know how many days it's been hot, and whether or not that is unusual for this time of year? We notice it's been raining for days and days - or at least it seems like it. Or perhaps it's been dry so long we cannot actually remember the last time it rained. But do we know how the current precipitation, or lack of it, compares to other years? We see an unusual number of dead trees in a forest where we've never noticed that before - but do we know if warming trends are exporting beetle kill or other parasitic insects to new regions? The kids next door are having a bad reaction to pollen this year - but do we know if this is an unusually bad year for pollen because it's warmer and wetter than last year? I am a big fan of the website and smartphone application ISeeChange as a community based social media tool. It allows users to report observations about the natural environment with ease and rapidity. I am especially excited about the contribution that cyclists and others who engage in outdoor activities can make by using this application - which is why I am writing this post. The website can be found here. A companion ISeeChange Tracker application is available on both IOS and Android. Founded in 2012, ISeeChange is the nation's first community crowdsourced climate and weather social media journal, which allows users to document ordinary and substantial changes in our natural environment through either the website or the mobile application. Being able to document what one is seeing or feeling personalizes and tracks climate change from the perspective of every day experiences, bringing science home and into the spaces people know best. Best of all, the data that ISeeChange users provide combines with data from other cutting edge satellite community observations and connects the public with NASA's Orbiting Carbon Observatory mission. The website and smartphone application allows community members to follow investigations over time and helps NASA uncover details that satellites observing the earth cannot see from space. The ISeeChange community has already helped to document trends and report major climate news in advance of mainstream media or government reports, including flooding, longer growing seasons, tree mortality, marine ecosystem shifts, record-breaking winter warmth, coral die off, increased insect borne diseases, and more. Although I have had the application on my smartphone (where I write these posts) for some time, I began using it more seriously on my last cycling tour along the Southern Tier. After a conversation in New Orleans with ISeeChange founder and CEO Julia Kumari Drapkin, I realized I don't need to make my comments necessarily intelligent - in many cases it's helpful to simply record an observation and ask a question. 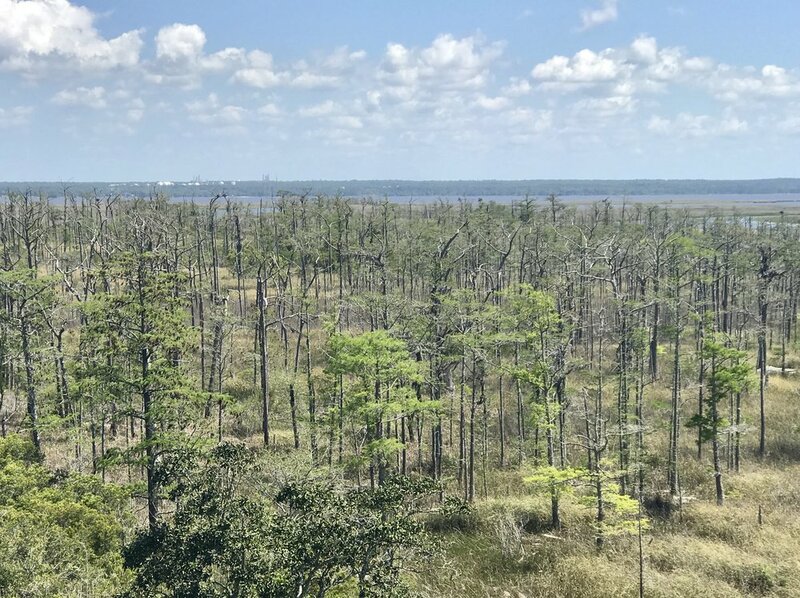 As an example, I was puzzled by seeing large tracts of dead trees in a swamp from an elevated highway in the Florida Panhandle. I posted a picture of the trees on the app (which automatically records location, weather data and time with each post) and simply asked if anyone knew why they were dead. Several days later I received a follow up text from ISeeChange telling me my post was a useful addition to growing evidence of tree stress in the south that was not yet understood but was beginning to be studied. It is my hope this post will inspire others- especially fellow cyclists- to look up the ISeeChange website and download the ISeeChange tracker on their smart phones. The more we observe and report about what we are seeing and experiencing in our natural environment, the more we will understand about what is happening around us. And maybe, just maybe, that will help us to make better choices.